Foot surgery is usually recommended by your podiatrist to relieve pain, correct a foot deformity, or restore function in your foot and/or ankle. Many times, it is a last resort and final option for treatment of a foot problem, condition or injury. Most foot surgery is elective, and can take place at the podiatrist’s office, in a hospital or at an ambulatory surgery center. Your doctor will help you decide the best option for you based on factors such as the type of procedure being preformed, your age, medical history and insurance coverage. Foot surgery usually requires commitment by the patient. There are several blood and urine tests, x-rays and other diagnostic testing that must take place before the surgery. Once the surgery is preformed, the patient is then required to follow the doctor’s strict healing instructions so the foot or feet can heal normally, or without complications. This section is dedicated to helping you understand more about specific foot surgeries you may or may not be having. Arthroscopy is a type of endoscopy—a surgical technique used to look inside the body without cutting it open. Performing arthroscopic surgery on the foot or ankle requires the use of a very small fiber-optic camera called an arthroscope. 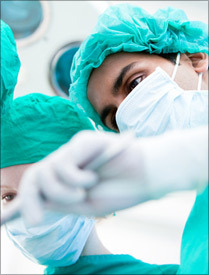 The surgical repair or replacement of a diseased joint is known as arthroplasty. This procedure may be considered when conservative treatments no longer provide adequate relief from joint pain and/or disability. An in-depth look into the surgical procedure endoscopic plantar fascia release: why it’s done, who needs it, potential complications, and much more. When conservative treatment options fail, a fasciotomy may be considered. This procedure is usually done on those with overuse injuries. Open ankle fusions are performed on those who may be suffering from an ankle disorder or deformity. Are you a candidate for this procedure? Learn more here. Arthroplasty surgery is not as common as other foot surgeries, and is usually the last resort for those with joint problems in their feet or ankles. Foot amputation can be a very traumatic experience. Learn what happens before, during, and after this procedure to help a loved one or yourself understand it better. Considering laser treatment for your toenail fungus? Learn about the entire process here. Bunion surgery is generally a last resort for the treatment of stubborn bunions. Learn more about the procedure, who’s a candidate and why, and the risks involved.